The new plans offer better flexibility to customer depending on usage and start from Rs 3,000. Ather Energy is an Indian electric scooter manufacturer founded by Tarun Mehta and Swapnil Jain in 2013. As of today, they offer two electric scooters – Ather 450 and 340. These were launched a few weeks ago. Now, they have announced 3 new subscription plans – to help owners maintain their scooters without any hassle. While the public charging facility via AtherGrid will remain free for all Ather customers till 31st December 2018, the 3 new plans are designed to suit the specific needs of customers depending on usage. Ather Connect is a base plan for Rs 3,000 + GST for the year. It includes Over-the-air updates to enhance ride experience, remote diagnostics for quicker service, ride recommendations and on-board navigation. The second plan is called Ather Service and is priced at Rs 6,000 + GST per year. This as the name suggests, is a more service focused plan and includes Vehicle service and Roadside Assistance + Ather Connect. 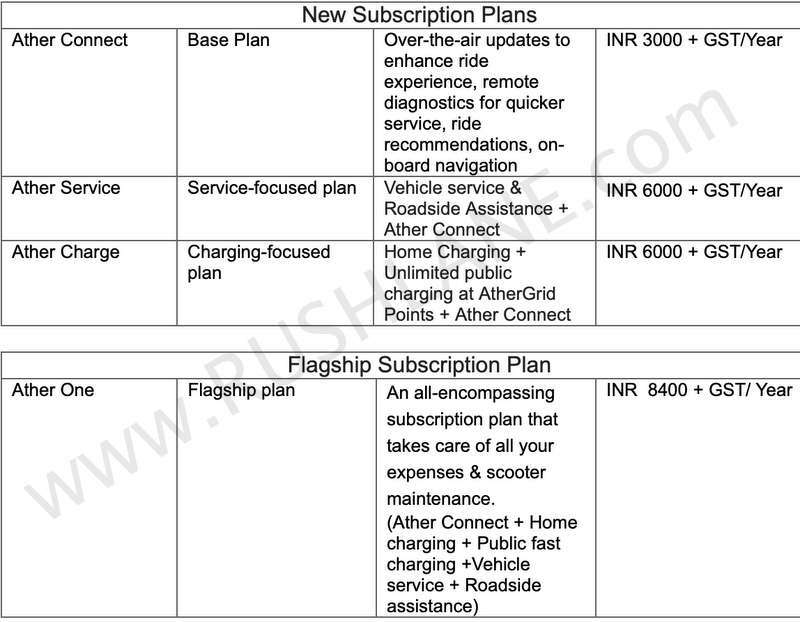 Ather Charge, is a charging focused plan, also priced at Rs 6,000 + GST per year and includes Home Charging + Unlimited public charging at AtherGrid Points + Ather Connect. Apart from these three plans, Ather Energy is offering its flagship plan which customers can avail of for Rs 8,400 + GST per year. This plan includes all of the three plans in one among which are Ather Connect + Home charging + Public fast charging +Vehicle service + Roadside assistance. Ather customers can avail free services for a year after the date of delivery while upon completion of this year, can select any plan of their choice. Ather 450 and 340 electric scooters were launched earlier this year. The Ather 340 is priced at Rs 1,09,750 while the Ather 450 carries a price tag of Rs 1,24,750. The two scooters come in with a charging cable, standard installation and 1 year subscription plan free of cost. Both the scooters are identical in style, dimension and features though the Ather 450 offers higher capacity output as compared to the Ather 340. Ather 340 is powered by a 4.4 kW motor offering 20 Nm torque. It has acceleration from 0 to 40 kmph in 5.1 seconds and a top speed of 70 kmph. Ather 450 on the other hand gets its power via a 5.4 kW motor offering 20.5 Nm torque. Acceleration from 0 to 40 kmph is achieved in 3.9 seconds and the scooter is capable of a top speed of 80 kmph. Both scooters get two drive modes – power and economy. Ather 340 delivers 60 km range in economy and 50 km in power mode. 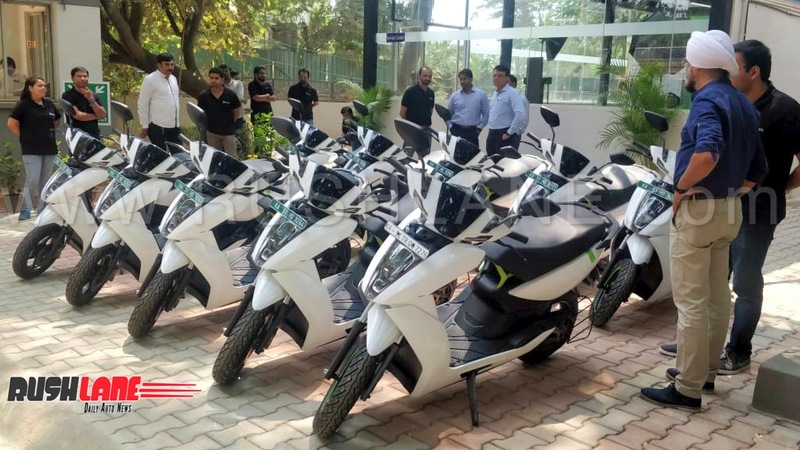 Ather 450 delivers range of 75 kms and 60 km in economy and power mode respectively.